Rest in Peace, Dear Flora!!!!!! YEREVAN, NOVEMBER 20, ARMENPRESS. People's Artist of the Republic of Armenia Flora Martirosyan died in the United States of America. The reason of the death was the difficulties, that arouse after her gall-bladder was operated on. As reports "Armnepress" the Public Television of Armenia published this news. Flora Martirosyan was the founder of the International Musical School after Komitas, "Artists for Peace" Charity Organization and the initiator of the cultural movement "Never Again". Flora Martirosyan was born in Gyumri on February 5, 1957. The Editorial Staff of "Armenpress" present the condolences to the family and relatives of the singer. Flora Martirosyan, a renowned singer and People’s Artist of Armenia, has died in Los Angeles, California, USA, today, the Ministry of Culture confirmed to ArmeniaNow. Reports from the United States said Martirosyan, 55, developed complications following a surgery, in particular, problems with her gall-bladder. Martirosyan, a native of Gyumri, graduate from the Yerevan Komitas State Conservatory’s Vocal and Choral Conducting Department. During her artistic career Martirosyan performed in more than 80 countries. She set up permanent residence in the United States in 1991, but remained attached to Armenia that he frequently visited and where she actively worked in the 1990s and 2000s. In 2011, Martirosyan initiated a series of “Never Again” concerts promoting genocide awareness and world peace. She planned to continue these concerts through 2015 – the year that marks the centennial of the Armenian Genocide. Martirosyan is survived by her two children and husband. 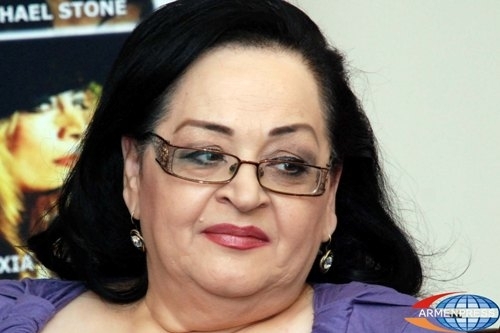 PanARMENIAN.Net - Famed Armenian singer Flora Martirosyan has died on November 20 morning at the age of 55. As the singer's close friend Artur Hovhannisyan told PanARMENIAN.Net the singer died from surgery complications. Flora Martirosyan, born February 5, 1957 in Gyumri, was the youngest in the family of 4 children. Having inherited vocal skills from her mother, the young singer took part in Garoun 73 song contest to win the 1st place among 800 participants. Later, as a soloist at a state folk orchestra the singer, has toured over 70 countries while also studying at Yerevan State Conservatory after Komitas. In 1991, the signer left for USA with her husband, to return to Armenia a few years later. From 1997 to 2001, she headed a Yerevan-based Music School after Armen Tigranyan in Yerevan. In 2002, the singer established an International Music Academy after Komitas in USA. In 2006, she initiated A Pan-Armenian Song Contest Festival. In 2008, the singer, jointly with Michael Stone created international organization Artist for Peace to raise awareness of crimes against humanity. In 2011, Martirosyan-initiated Never Again peace concert featured world-famed artists Stevie Wonder, Chaka Khan, Eric Benet, Pras, Malina Moyem united in a cause against injustice. Edited by Zartonk, 20 November 2012 - 10:44 AM. and the organization of the procedures. the initiator of the cultural movement "Never Again". Ministry of Culture of the Republic of Armenia informed "Armenpress"
of the burial the decision will be up to the aforementioned committee. Martirosyan was born in Gyumri on February 5, 1957. PanARMENIAN.Net - According to Zhoghovurd daily, Prosperous Armenia party leader Gagik Tsarukyan and other entrepreneurs donated major sums to the family of Flora Martirosyan to ship the late singer’s body from the U.S. to Armenia. shipment costs - ??? that's not the correct word.. sounds like your shipping woodd. YEREVAN. – Under the decision of the Armenian PM Tigran Sargsyan, a commission has been set up to organize the funeral of the Armenian celebrity folk singer Flora Martirosyan. The commission is headed by the Minister of Culture Hasmik Poghosyan. “All the expenses regarding the transfer of the body to Armenia, and the funeral will be covered by the Government,” Ministry of Culture representative Hasmik Hakhverdyan said, adding the day of the transfer is not yet fixed. To note, Flora Martirosyan died in Los Angeles on Nov. 20 as a result of the complications following a gall bladder surgery. burial ceremony will take place the same day in Yerevan Pantheon. gallbladder surgery are thought to be the cause of her decease. earned as a distinctive singer and Armenian artist". PanARMENIAN.Net - Moscow will bid farewell to famed Armenian singer Flora Martirosyan. As the Union of Armenians of Russia told PanARMENIAN.Net on Tuesday, December 11, Surb Harutyun Armenian church in Moscow will host a public prayer in commemoration of the singer. The last farewell to legendary Armenian singer Flora Martirosyan will be held in capital Yerevan on Tuesday morning. According to a press release by the Ministry of Culture, the funeral service will be held in the Aram Khachatryan concert hall from 12:00 until 14:00 pm. The singer will be buried in the Yerevan City Pantheon later in the day. An outstanding representative of the Armenian singing art, Martirosyan passed away on November 20. With her amazing voice and high mastery, she moved the hearts numerous Armenian and foreign music lovers for many years. The singer was born on February 5, 1957 in Armenia’s second largest city, Gyumri. After leaving a local musical school and a college, she pursued her musical education at the Komitas State Conservatory, majoring in folk song. The Armenian Folk Instruments Ensemble, where Martirosyan was a soloist from 1976 until 1991, played a crucial role in the singer’s career. She then continued her work in the United States (in the 1990s), committing herself to the preservation of the Armenian nation’s identity and the building of cultural bridges between the homeland and diaspora. Back to Armenia in the late 1990s, she was the headmaster of Gyumri’s Armen Tigranyan musical school for four year (1997-2001). From 2002 till 2008, Martirosyan became the founder and chief of the Burbank and Hollywood Musical schools. In 2006 and 2007, she organized the Komitas International Song Contest in Yerevan brining together around 2,000 Armenian children from Armenia and foreign countries. Martirosyan was the founder of the Artists for Peace Charity Foundation, which attracted world-renowned singers and Hollywood super-stars to raise a voice of protest against the Armenian Genocide and all crimes against humanity under the slogan Never Again. Dear Mr. President, please tell us why Flora lived and died in Glendale , 10 thousand miles away from Gumi. Is hypocrisy an Armenian WORD? Is the Dollar mightier than the Dram? Dear Mr. President, please tell us why Flora lived and died in Glendale , 10 thousand miles away from Gumi. Is hypocrisy and Armenian WORD? YEREVAN.- Armenia’s President Serzh Sargsyan and his spouse Rita Sargsyan bid the final farewell to the famous folk singer Flora Martirosyan. The ceremony took place in Aram Khachatrayn concert hall and was attended by numerous fans of the Armenian singer. 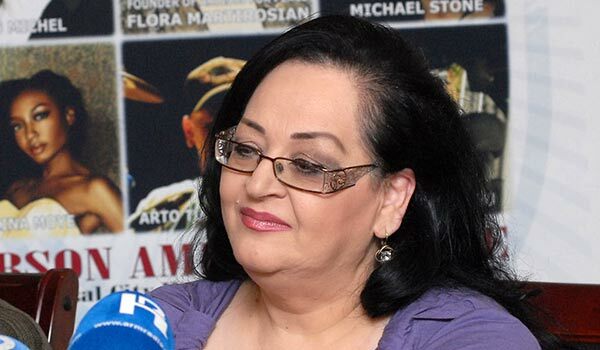 Flora Martirosyan died in Los Angeles on Nov. 20 at the age of 55.
to know the singer's cause of death. Flora Martirosyan did not have any health problems. He highlighted that Martirosyan went to the surgery "on her own legs,"
the hospital, that is, when the unfortunate event happened.